This time of year every movie site and blog has lists of top horror movies and films to make you hide behind the sofa. In an effort to be that little bit different, I have compiled a list of 5 “scary” movies that are not horror films (i.e. no monsters, ghosts or slashers) that still have the same effect! The list is no particular order. Not doubt this list will spark controversy, disagreement and hopefully, downright anger! Robbins plays a traumitised Vietnam vet who suffers awful hallucinations and flashbacks of his failed marriage and dead son (Culkin). The line between reality and fantasy runs very thin and we are left wondering just how real his fantasy is throughout the film. The film is riddled with religious undertones throughout, the movie title of course a reference from the bible and his new wife, Jezabell, also taken from the bible. She’s not a very nice woman really. Directed by Adrian Lyne (Yep that’s Adrian “Flashdance, Fatal Attraction and Nine 1/2 Weeks’ Lyne. ), still a movie worth a Hallowe’en watch today. There are very few movie lists, be it top film, top horror, top blah blah, that doesn’t include Se7en in some part. Every movie fan in the world has seen it at this stage. (* Not a factually based statement). Se7en follows the story of 2 homicide detectives on the chase after a Serial Killer who takes his inspiration from the 7 Deadly Sins. Shot beautifully in a Film Noir style, the performances are top, even Pitt who at the time was the latest “pretty boy” to enter the movie world yet manages to pull off a convincing performance as the ambitious, young and cocky detective. Despite the heavily gloomy theme throughout, the ending offered a contrastig opposite setup to the film noir style of the film but did not fail to deliver with its carthatic finale. Rather than show a trailer of the movie, I will instead show you an excellent parody filmed by the band Radiohead as a video for the song 15 Steps from the album In Rainbows. Enjoy! Despite Friedkin rarely pulling off a cracker of a movie nowadays, he still remains one of my favourite directors. HIs 2006 film, Bug had a limited release in Europe despite the extended run in the theatre in the US. Starring Ashley Judd, Harry Connick Jnr and Michael Shannon, the film is based on a stage play of the same name. Mostly shot inside a motel room, we follow an unstable war veteran as he drags a lonely woman into his world of paranoia when the bugs arrive. The loser waitress, getting grief from her ex-con husband starts to fall in love with this very strange war vet. The vet find bugs in the motel room and believes them to be an experiment of the American government. The film is riddled with psychological warfare often putting the viewer in a state of unease and invoking bouts of depression! The performances are outstanding, particularly from Judd who appears to have put in much effort both mentally and physically for the role. I was also impressed by Michael Shannon’s performance and the convincing nature of his role as the war vet. Shannon however did play the same character in the stage version which probably explains his natural flow with the character. Despite the performances and script, Bug was only given a limited release and took Friedkin a number of years to fund the project. I expect the grim nature and often “shlocking” nature of the film played a part in this. Well worth a watch though. Directed by Michael Haneke, you would be mistaken from thinking my date above should have read 2007 but my preference of the 2 movies is the ’97 Austrian original. In summary, 2 psychotic young men take a family hostage in their holiday home and force them to carry out sadistic games for amusement. In line with with the themes of the previous films I’ve listed, Funny Games often blurs the line between reality and fantasy as at many points it appears the 2 psychos (sorry I dont know what else to call them!) address the camera directly. When the film was originally screened in Cannes in the year of it’s release, many people walked out, including critics in disgust. 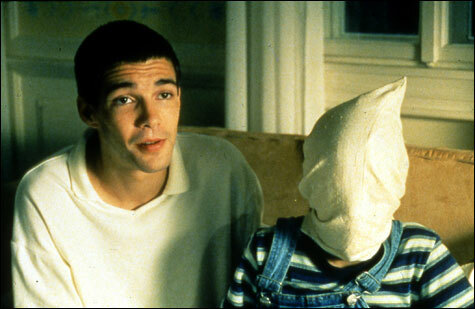 Haneke claims he never intended to make the film a horror, but his idea was to make a point about violence in the media. The film is an unsettled watch and the performance of leading lady, Susanne Lothar help to solidify the unsettled nature of the ordeal. Haneke claimed that Lothar would often cry for 20 minutes before takes which would result in her being physically drained on camera heightening the effect. The reason why I selected the original movie over the remake is because I believe it to be the stronger of the 2 (Despite an almost shot for shot remake). Somewhat a controversial choice. But a good one none the less. Apparently at a screening in Dublin’s IFI cinema, a number of viewers walked out, including some plonker who checked himself into hospital but was later discharged. Sitting in on a special audition seeking an actress, Aoyama becomes besotted with one auditonee and persues her after the interview. However the auditionee, Asami, is quite perculiar, her CV doesnt completely check out and one of the co-panel finds something uncomfortable about her. It turns out that she is a bit of a whack job, having been sexually abused as a child, she now likes to torture and cut up people. There is no really nice way to say that on your CV I guess. Back to the controversy I hinted at, well the film isn’t all that disturbing until you reach the final 15 minutes or so. The less said about it the better, just go watch it. But not as a date movie! And that completes my list. Hopefully there has been something of interest there for everyone. But no doubt there are many who feel the list is incomplete, shite or they could do it better. So what do you think? ← Who watches the “Watchmen”… ending?